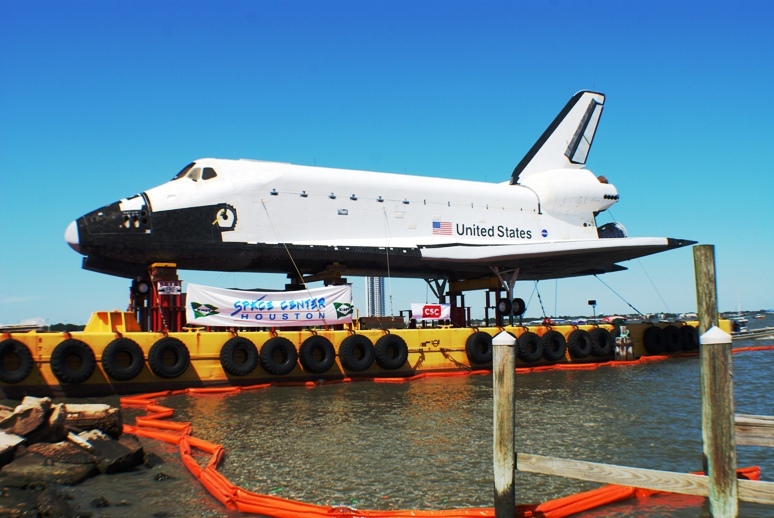 A full-size shuttle replica atop a barge arrives at the Johnson Space Center docks in Houston. After its hopes of landing a retired Space Shuttle were scrapped, Houston is now home to the next-closest thing — a full-size replica. Friday marked the end to an 8-day voyage across the Gulf of Mexico for the orbiter mockup that had previously welcomed visitors to Kennedy Space Center in Florida. Hundreds crowded along the shoreline to witness the historic arrival of “Explorer” as it navigated the waters of Clear Lake atop a barge. The ship that never left the Earth will become the centerpiece of a new educational exhibit at Space Center Houston, the official visitors center of the Johnson Space Center. In a salute at sea, two fire boats sprayed an arch of water for the shuttle to pass under as it approached its new home. Waiting on the shore — a crowd of onlookers and a “Shuttlebration Weekend” of activities featuring parades, fireworks, and music. A pair of NASA T-38 Talon jets soared overhead in formation as the National Anthem was sung to mark the kickoff of the celebration. Despite the fanfare and excitement, this is not the way the City of Houston had hoped to memorialize its connection to the Space Shuttle Program. After 30 years and 135 missions in orbit, Houston made public its desire to win a retired Space Shuttle at the conclusion of the program. Serving as the home to Mission Control and the training site for every shuttle mission, the city argued it was an obvious choice. NASA administrators had other plans. When the agency released the permanent locations for its shuttle fleet, critics vocalized their displeasure that the Johnson Space Center would not receive its own orbiter. Instead the four orbiters would find permanent homes in New York City, Los Angeles, Washington, D.C.’s Smithsonian, and Kennedy Space Center in Florida. The logic used in passing over Houston was solid, according to a 26-page review by the NASA Office of the Inspector General (OIG) . The watchdog group concluded NASA did not violate federal laws and dismissed notions that outside pressure influenced the location selection. According to the OIG, each potential site was vetted using a 9-point criteria that scored everything from the location’s ability to raise necessary funds to attendance numbers. Space Center Houston’s low score was primarily attributed to lower international access and visitor attendance figures. Real or not, this shuttle requires a mammoth undertaking just to move the replica to its new home. Saturday, workers using a crane carefully hoisted Explorer from the barge and placed it onto a mobile transfer vehicle to make a mile trek from the docks to Space Center Houston. The replica is the largest item to move through the Johnson Space Center Docks since segments of the Saturn V rocket used in the Apollo program arrived in 1977, according to organizers. Early Sunday, the replica took longer than the scheduled three-hour crawl, escorted by NASA’s prototype planetary rovers for future missions. Trees were tripped and light posts were moved to accommodate the extra-wide load. Later that morning visitors to Space Center Houston got an up-close look at the new attraction. This fall, once the replica is in place and refurbished, visitors to Space Center Houston will be able to tour the flight deck and payload bay of the full-size mockup. Click here to view a slide show of my photos from the shuttle replica’s arrival.